Thanks to skills learned this summer from Florida United Methodists, teenagers across the globe are building their own bunk beds and putting the finishing touches on a newly rebuilt dormitory at the Methodist mission of Quéssua in East Angola. The dorm is expected to open in about a year. 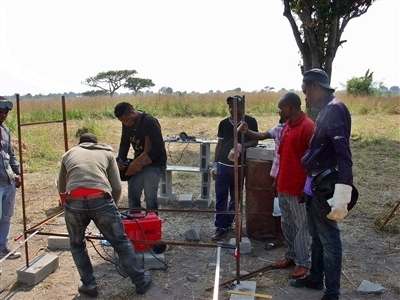 When it does, new opportunities will open up for scores of Angolan young people. About 200 boys, from preteens to age 22, will be housed there – about four times the current number. And an existing residential hall, with space for 50 students, will become a home for girls. With the help of a mission team from Harvest UMC, Bradenton, a group of boys in Quéssua builds a bunk bed unit, one of many that will be needed for a new boys' dormitory. Photo from Florida/East Angola Partnership. 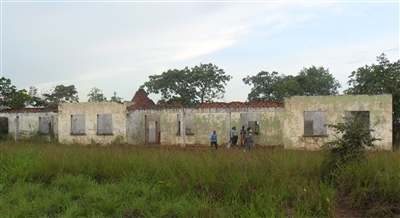 As in summers past, young Angolans worked side by side with visiting mission team members from Harvest UMC, Bradenton, to put the physical pieces of their community back together after it was destroyed by almost 30 years of civil war. But more importantly, the spiritual relationships severed by war are reconnecting through the Florida/East Angola Partnership. The alliance between conferences was formed more than 10 years ago to begin the restoration of what had been a well-respected center for agriculture, learning, health care and Methodism before the war. Since then, a theological sanctuary, the church, a dormitory and a high school for more than 1,100 students have been repaired or rebuilt. "What we have done there in helping to rebuild in this very wonderful place called Quéssua and helping the boys to be future leaders in their country is something we can all be proud of," said Tony Gowgiel, Harvest's mission team leader. In June, Gowgiel led an eight-member team from Bradenton to East Angola for two weeks of construction work and church ministry. Two sewing machines, fabrics and other supplies also were presented to a women's sewing cooperative. And a moving lecture by one team member on the challenges of teaching people with physical and learning disabilities drew a large crowd, including East Angolan leaders and a radio station that aired the meeting. Harvest UMC is one of several in the conference that have accepted East Angola as a mission site. Others choose to participate through in-kind donations of clothing and supplies or cash donations that keep the work moving forward. Above, the ruins of the boys' dormitory in Quéssua wait for restoration after being destroyed by civil war. Below, thanks to the Florida/East Angola Partnership and the work of mission teams and community volunteers, the rebuilt dorm is expected to open in about a year. Photos from Florida/East Angola Partnership. Gowgiel took a refresher course in arc welding before making the trip so he could teach about a dozen high school-age students how to make bunk beds. The students live at Quéssua and will move into the new dormitory when it is completed. Under supervision, the students built two beds. With their newfound skills, they put together another dozen or more while the Harvest team was there. They also were taught electric wiring skills. On their own, the students will have the skills to keep rebuilding. "They are very serious, very committed," said Icel Rodriguez, Global Missions director for the Florida Conference. She and her husband, Rev. Armando Rodriguez Jr., member and former chairperson of the East Angola/Florida Partnership, visited East Angola in February. Among the Florida Conference leaders who joined them were Rev. Dr. Sharon Austin, director of Connectional Ministries, and Rev. Dr. Walter Monroe, South Central District superintendent, as well as members of the Yellowstone Conference. The Rodriguezes were host missionaries at Quéssua from 2009 to 2010. Since 2011, Rev. Dr. Leonardo Garcia and his wife, Rev. Dr. Cleivy Benitez, of the Methodist Church in Cuba have taken on that role. The one-week trip in February was a time to assess what has been accomplished and set goals for the future. Monroe and Austin taught at the seminary and preached at area churches as well. Monroe said in an interview shortly after returning to Florida that he was impressed by the large number of young people who came to worship. He was also touched by the pastors who walked or hitchhiked long distances to hear him share insights about preaching. A woman with a baby on her back sweeps the steps of her modest home in Quéssua. Photo by Rev. Armando Rodriguez Jr.
“You could see the expression in their faces as they thanked you for the information,” he said. It was his first visit to Quéssua, and the mission was not quite what he expected. 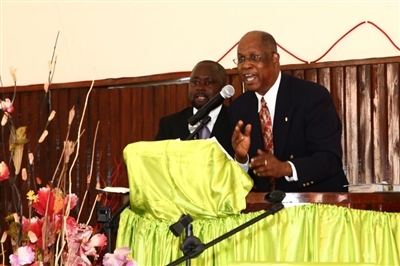 The experience brought home the importance of being a connectional church, Monroe said. Efforts will continue in support of education and rebuilding the infrastructure, and a renewed focus will be put on outreach to girls, Armando Rodriguez said. There are challenges due to the war, as well as biases against providing education to females. 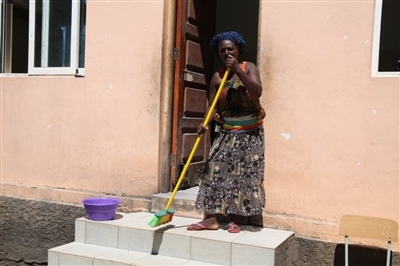 A boarding house rebuilt in the nearby larger city of Malange has had difficulties. Rev. Dr. Walter Monroe, above, preaches to a Methodist congregation in Malange near Quéssua. Below, choirs at Central Malange UMC prepare to lead musical worship. Photos by Rev. Armando Rodriguez Jr.
"Only a few girls have been able to study there," Armando Rodriguez said. "Women work the fields more than men. … It is a cultural issue but also an infrastructure problem." For the girls to occupy the old boys' dormitory, he said, leaders and mentors will be needed to supervise the girls and secure their safety. Harassment of girls is a serious problem, he added. "We would have to find surrogate parents for mentorships. That is the goal." There is a lot of work still remaining to reach full recovery. During the civil war, about 1.5 million people lost their lives and about 4 million were displaced. Education, skills training and church ministry were disrupted. 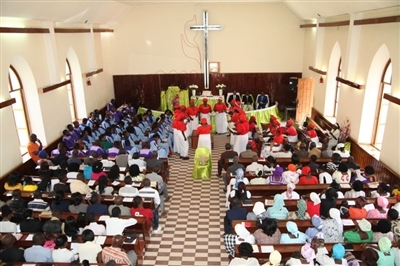 Now the East Angola UMC is reconnecting internally and also with the global UMC community. "The simple fact of having people visit them -- the mission support, the love they receive -- lets them know they are not alone," Armando Rodriguez said. "You cannot put a price on what it means to them. "We say we are a connectional church and that is one of our main strengths. During the war, they were not connected at all and now they are connected." Gowgiel hopes that Harvest will be able to send another mission team next year. "It's a wonderful place and a very blessed place," he said. "It's hard to put into words." Kathy Steele is a freelance writer based in Tampa. Florida Conference Connection editor Susan Green contributed to this story.